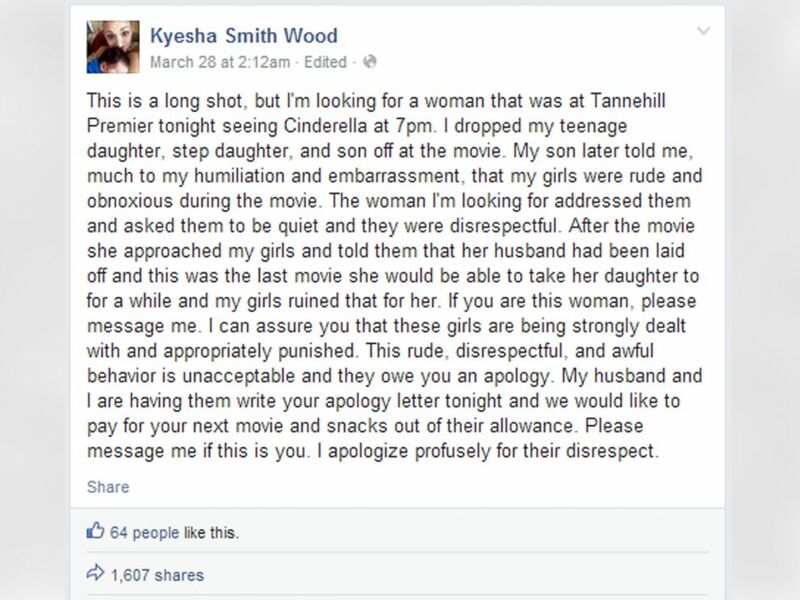 A moviegoer who got an apology over social media from a mom who said she was mortified by her children's "rude and obnoxious" behavior at the movies wrote in her own Facebook message that the apology "brought me to tears and shows there [are] still good people in the world." Kyesha Smith Wood, of Birmingham, Alabama, dropped off her son, daughter and step-daughter at the movies, she said in a Facebook post early Saturday morning. The son is a teenager and the two girls are 13, according to ABC's Birmingham affiliate, ABC 33/40. Kyesha Smith Wood wrote this Facebook post, March 28, 2015. Do Kids Deserve the Same Freedoms Their Parents Had? "My son later told me, much to my humiliation and embarrassment, that my girls were rude and obnoxious during the movie. The woman I'm looking for addressed them and asked them to be quiet and they were disrespectful," Wood wrote on Facebook. "After the movie she approached my girls and told them that her husband had been laid off and this was the last movie she would be able to take her daughter to for a while and my girls ruined that for her." Wood's post asked for the woman to contact her. "This rude, disrespectful, and awful behavior is unacceptable and they owe you an apology," Wood wrote. When sheriff's office Sgt. Jack Self saw Wood's post, he shared it on the Jefferson County Sheriff Facebook page. The post generated more than 245,000 likes after the sheriff's department asked, "What do you think of the way this local mom is handling this situation?," and added, "Looks like these children have great parents." "I live in that community," Self told ABC News today. "I just felt like if I could put it for a bigger audience, maybe she could find the lady she was looking for." The Birmingham mom's message spread and the apparent mystery woman -- Rebecca Boyd of Adger, Alabama -- left a comment on the sheriff's office post. "I am the mom from the movie theatre," Boyd wrote in the comment. "I had taken my daughter to see Cinderella..I was very upset and disappointed in the girls behavior...the note from their mom brought me to tears and shows there is still good people in the world. I have no hard feelings towards them and I am proud of their parents. The girls are not not bad...they are children. Glad they are learning a lesson. I hope if my teenagers are out and they act up...I hope someone says something to them." "She's the most gracious, kind and forgiving woman," Wood told ABC 33/40. "I am so humbled by that." Wood's daughters will write an apology letter to Boyd, according to Wood's Facebook post, and also contribute some of their allowance towards the Boyd family's next trip to the movies. "My girls are so mortified," Wood told ABC 33/40. "They are humiliated. And that's OK because I told them, 'You know what, you're not going to do this again." ABC 33/40 said the publicity over the story has resulted in support and job offers for Boyd's family. Boyd told ABC News today she'd like to see the girls again.